Pencils Books and Dirty Looks is having an AMAZING 300 follower Giveaway. Don't you just love her name?! Heheh. 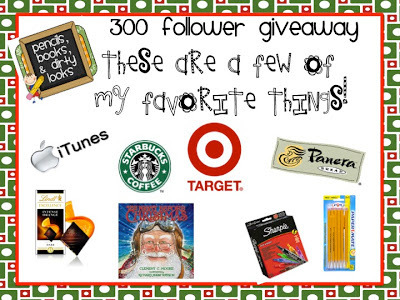 Head on over to her blog to check out all of her favorite things (that she is so graciously sharing with one lucky winner, who I hope will be me)!. I LOVE Panera bread. We don't have one here in Hawaii but every time I make it out to the mainland I always need to stop at one for some broccoli cheddar soup. YUM. Sam's Club recently started selling Panera Bread's Broccoli cheddar soup but it is nothing like eating it fresh from the store. It actually doesn't even taste that good. haha. Congratulations, Aimee on 300 followers! !